Born in Pyŏngan Province in today's North Korea, Nak Chung Thun (1875-1953) emigrated to California via Hawaii in 1907, settling in Riverside and working as a laborer for most of his life. Until his passing in 1953, Thun privately wrote dramas and epic fiction in his native tongue, leaving behind a literary estate that is today a precious discovery for both Korean and Korean American literary historians. 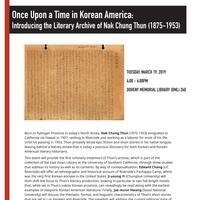 This event will provide the first scholarly treatment of Thun's archive, which is part of the collection of the East Asian Library at the University of Southern California, through three studies that address its history as well as its contents. By way of contextualization, Edward Chang (UC Riverside) will offer an ethnographic and historical account of Riverside’s Pachappa Camp, which was the very first Korean enclave in the United States. Ji-Young Yi (Chungbuk University) will then shift the focus to Thun's literary production, looking in particular at two full-length novels that, while set in Thun's native Korean province, can revealingly be read along with the earliest examples of diasporic Korean American literature. Finally, Jae-moon Hwang (Seoul National University) will discuss the thematic, formal, and linguistic characteristics of Thun’s short stories that are set in Los Angeles and Riverside. The panelists will address the current editorial state of the Thun archive all the while detailing the initiatives that are underway to bring some of it to publication. Joining them will be Steven Lee (UC Berkeley) and Naoki Watanabe(Musashi University) as discussants and USC’s Kenneth Klein and Sunyoung Park as moderators.